I admit it. I have been avoiding Simon Schoenthal. Not for any bad reason, but simply because he and his wife Rose Mansbach had ten children. Ten. I just couldn’t get myself motivated to follow up on their ten children, each of whom was my first cousin, twice removed. That is, those ten children were my grandmother Eva Schoenthal Cohen’s first cousins. And once she married and moved to Philadelphia in 1923, she was living not far from most of these cousins. Maybe she knew them well. I should be more motivated, but I’ve been procrastinating simply because I was overwhelmed by the number of children to research. But it’s a new year, and the time is now, so here we go. First, to recap what I’ve already written about Simon and Rose and their children. Simon was the fifth child of Levi Schoenthal and Henriette Hamberg and was born on February 14, 1849. He was nine years older than my great-grandfather, his brother Isidore. 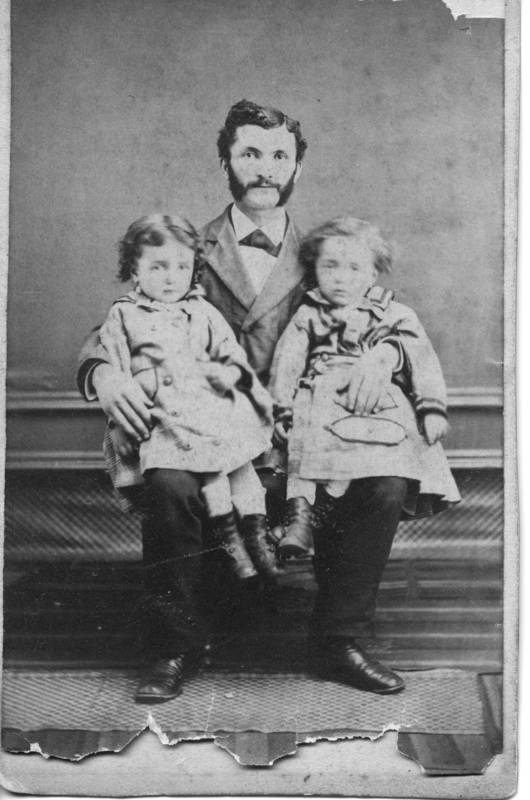 Along with his sister Amalie, Simon arrived in Washington, Pennsylvania, in 1867, a year after their older brother Henry had settled there. Simon was a bookbinder and occupied in that trade for many years after he first came to the US. In 1872, Simon married Rose Mansbach, and in the 1870s they had five children: Ida (1873), Harry (1873), Gertrude (1875), Louis (1877), and Maurice (1878). By 1880, Simon, Rose and their children had moved to Philadelphia, where Simon continued to work as a bookbinder. They had five more children in Philadelphia: Martin (1881), Jacob (1883), Hettie (1885), Estelle (1888), and Sidney (1891). Their oldest daughter, Ida, twin of Harry, died in 1887 from heart disease, leaving nine living children. In the 1890s, Simon left the bookbinding business and turned to other fields. He sold cigars early in the decade, and then by 1898 he and his family had relocated to Atlantic City, where he had a “bric-a-brac” store. What brought them to Atlantic City? In fact, what had led Simon and Rose to move from Philadelphia to Atlantic City in the first place? I’ve been to Atlantic City twice since its revitalization in the 1980s, and I’ve played Monopoly since I was a little girl and know many of the famous street names from that game—Pacific, Illinois, Indiana, Mediterranean, Park Place, and, of course, the Boardwalk. 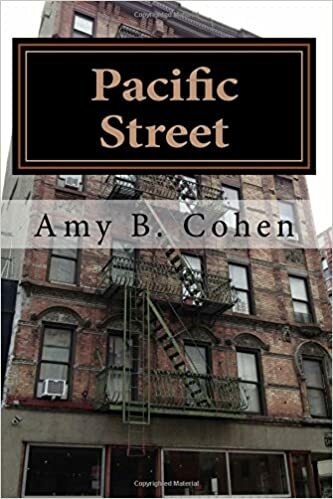 But I didn’t know much about the history of the city or what it was like in the late 19th century and early decades of the 20th when Simon Schoenthal and his children were living and working there. The official website for Atlantic City provides a fairly detailed history of the city. Up until the mid-19th century, the island upon which Atlantic City was built was a fairly unsettled place. Originally settled by the Lenni-Lenape Indians, the first permanent settlement by non-native Americans was not established until 1785 when Jeremiah Leeds settled there. As late as 1850, there were only seven permanent homes on the island, all belonging to Leeds and his descendants. Then in 1854, the first railroad line was completed, connecting Atlantic City to Camden, New Jersey, and in 1870 the first official road was completed. By 1878, one railroad couldn’t handle all the passengers wanting to go to the Shore, so the Narrow Gauge Line to Philadelphia was constructed. At this point massive hotels like the United States and the Surf House, as well as smaller rooming houses, had sprung up all over town. The first commercial hotel the Belloe House, located at Massachusetts and Atlantic Ave., was built in 1853, and operated till 1902. The United States Hotel took up a full city block between Atlantic, Pacific, Delaware, and Maryland (the current site of the Showboat Parking lot). These grand hotels were not only impressive in size, but featured the most updated amenities, and were considered quite luxurious for the time. There were beautiful hotels, elegant restaurants, and convenient transportation, but the businessmen of Atlantic City had one big problem to contend with…SAND. It was everywhere, from the train cars to the hotel lobbies. In 1870, Alexander Boardman, a conductor on the Atlantic City-Camden Railroad, was asked to think up a way to keep the sand out of the hotels and rail cars. Boardman, along with a hotel owner Jacob Keim, presented an idea to City Council. In 1870, and costing half the town’s tax revenue that year, an eight foot wide wooden foot walk was built from the beach into town. This first Boardwalk, which was taken up during the winter, was replaced with another larger structure in 1880. On Weds. June 16, 1880, Atlantic City was formally opened. With fanfare the likes few in the area had seen, a resort was born. 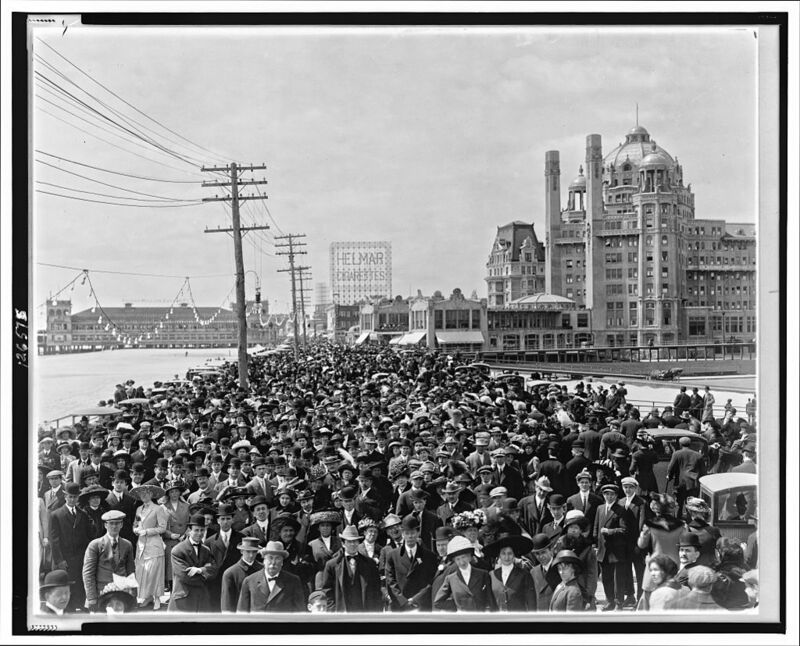 By the census of 1900, there were over 27,000 residents in Atlantic City, up from a mere 250 just 45 years before. The city boasted a prototype rollercoaster by the late 1880s. In the decades around the turn of the twentieth century, middle and working class Philadephians, and soon others from up and down the East Coast, would come to play by the seaside. Vendors hawked their wares. James’ Saltwater Taffy became “Famous the World Over.” Mechanical marvels took tourists on daring rides that made their stomachs turn. Children rode carousels, and families dined in seaside cafes. Concerts were held on the sand every evening and the many hotels up and down the shore held gala dances. Atlantic City seemed to have developed two personalities. On the one hand, the resort was promoted as a restful and wholesome vacation spot, offering sun and surf. On the other hand, tourists reveled in the boisterous atmosphere spawned by a festival of midways, numerous amusement piers (such as the one H.J. Heinz purchased to popularize his 57 varieties of pickles), and a selection of rollicking rides. Thus, my relatives arrived as the city was booming, and it must have seemed a place of great opportunities for them and their children. 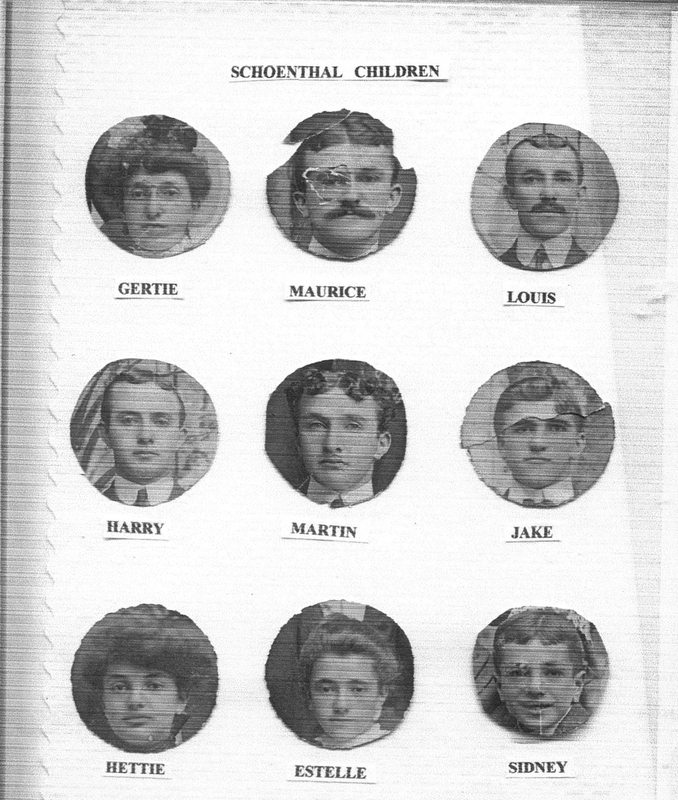 In 1900, the older children of Simon and Rose Schoenthal were young adults. Harry was a student at Juniata College in Huntingdon, Pennsylvania; Louis, Martin, and Jacob were still living at home with their parents, but working: Louis was selling cigars, and Martin and Jacob were working in the laundry business. Maurice was not listed in the 1900 census, as far as I can tell, but he also was living in Atlantic City in the early 1900s, according to the 1904 Atlantic City directory. In fact, four of the brothers appeared to be working in a related business at that time. All four brothers were living at 22 Delaware Avenue in Atlantic City. It appears that Martin and Jacob were running a laundry called Incomparable Laundry at 1432-1434 Atlantic Avenue and that Louis was running a cigar, tobacco, stationery and sporting goods business at the same location. Louis also listed a billiards and pool hall on “S Virginia av n Beach.” Maurice is listed as a manager at “S Virginia av, Ocean end.” The three youngest children, Hettie, Sidney, and Estelle, were still young and living at home in 1900. The oldest daughter, Gertrude, had married Jacob Miller in 1898, and they were living in Pima, Arizona, where they would have three children: Juliette (1900), Harry (1902), and Sylvester (1905). The last child, Sylvester, was likely named for Simon Schoenthal, who died on March 26, 1904, when he was only 55 years old. So what happened to the nine surviving children of Simon Schoenthal after he died? For one thing, most of them lived long lives, especially for that generation. Martin lived to only 67, but Hettie lived to be 103 and Sidney lived to be 100. All the rest at least lived into their 80s. Almost all of them were married and had children and then grandchildren. That’s a lot of years and a lot of people. You can see why I was procrastinating. Harry does not appear in the Atlantic City directories between 1903 and 1910, whereas his younger brothers are listed in those years. Harry does appear, however, in the 1910 census, living in Philadelphia, where he was boarding with a family named Wirtschafter. The head of the household, Joseph Wirtschafter, and his wife and three children had several other boarders living in their household in addition to Harry. Harry’s occupation is listed as the owner of a retail saloon, and Joseph’s occupation was a laborer in a liquor establishment. Perhaps Harry’s landlord was working for him. This photograph, shared with me by the family of Harry’s sister Hettie, is labeled “Uncle Harry’s Beer Business ? Philadelphia,” so I assume it refers to the liquor business owned by Harry Schoenthal. One of Joseph Wirtschafter’s children on the 1910 census was a 21 year old daughter named Esther. Later that year, Harry, who was sixteen years older than Esther, married her. 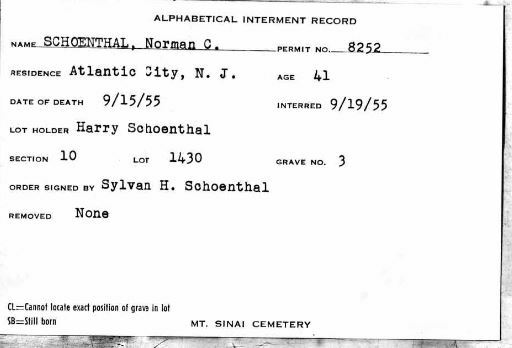 In 1912, their first child, Sylvan Harry Schoenthal, was born (presumably named for Harry’s father Simon) and in 1914, their second son, Norman, was born. 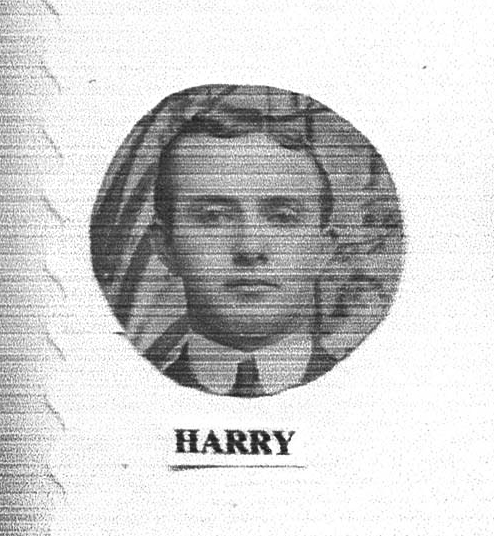 In 1918, they were living in Philadelphia at 2153 North Howard Street, according to Harry’s draft registration for World War I. Harry listed his occupation as “merchant” and was self-employed. By 1920, however, Harry’s circumstances had changed. His in-laws, Joseph and Jennie Wirtschafter, had relocated to Atlantic City and were the proprietors of a hotel located at 139 St. James Place. According to the Atlantic City directory, the name of the hotel at that address was the St. James Hotel. Harry and Esther and their two sons were also living at the same address in Atlantic City, where Harry was now employed as a clerk in the hotel. His mother Rose and his thirty year old sister Estelle (listed as Stella) were also living with them. The 1922 Atlantic City directory lists Esther Schoenthal and her brother Charles Wirtschafter as the hotel proprietors at 139 St. James Place. Atlantic City became “the” place to go. Entertainers from vaudeville to Hollywood graced the stages of the piers. Glamorous Hotels like Haddon Hall, The Traymore, The Shelburne and The Marlborough-Blenheim drew guests from all over the world. By the 1920s, Atlantic City also had become a pre-Broadway show tryout town, a practice that continued until 1935. With the entrance of show business, the resort increasingly attracted celebrities who added a special element of glamour. Even as the city declined as a Broadway showcase, the celebrities continued to grace the city in the decades to come. Over the years people like Sophie Tucker, Jimmy Durante, Fanny Brice, Harry Houdini, Milton Berle, Martha Raye, Guy Lombardo, Irving Berlin, Frank Sinatra, Dean Martin, Jerry Lewis, Marilyn Monroe, and many more would be spotted around town. Though the economy hit hard times in the 1930s, people continued to flock to Atlantic City. It became even more well known when it became the city featured in the Depression-era hit game, Monopoly, where players handled large sums of money and strategized to buy the best property along the boardwalk. 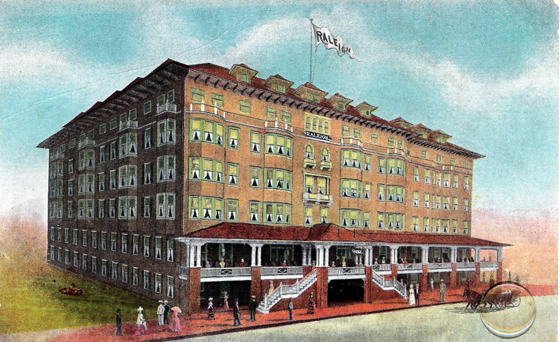 According to a passenger manifest dated February 16, 1925, Harry and Esther were living at the Hotel Raleigh, located at 170 St. Charles Place in Atlantic City. This is consistent with the 1930 census record for Harry and Esther, which has them living at 170 St. Charles Place in a hotel. The census reports that they were the father-in-law and mother-in-law of the heads of household, which had me quite confused for a while. Harry and Esther had sons who were eighteen and sixteen in 1930, so it made little sense. Reading through the record of all those listed at 170 St. Charles Place, I found that the head of the household was Charles Wirtschafter, Esther’s brother. Harry, now 56, was listed as retired, and Charles must have been running the hotel. Esther and Charles’ father Joseph Wirtschafter, now a widower, was also living in the hotel. So Harry and Esther were actually brother-in-law and sister of the head of household. As for their two sons Sylvan and Norman, neither one was listed as living with their parents on the 1930 census. In 1930-1931, Sylvan, then 18-19, was a freshman at Franklin and Marshall, according to the F&M 1931 yearbook. But where was he when the census was taken early in 1930? Norman was only sixteen in 1930—where could he have been? Boarding school? Living somewhere else? Just skipped by the enumerator? I don’t know. But neither appears on the 1930 census. If Sylvan and Norman were going to Atlantic City for Thanksgiving, the implication is that neither son was living in Atlantic City at that point but rather presumably in Washington, DC, where the newspaper was published. I did find Sylvan listed in both the 1933 and 1934 Washington, DC, city directory; in both years he was working at in the Shoreham Hotel and living at 2709 Woodley Road. According to the 1940 census, Sylvan was still living in Washington, DC, in 1935. As for Norman, he is not listed in the Washington, DC, city directories during the 1930s. 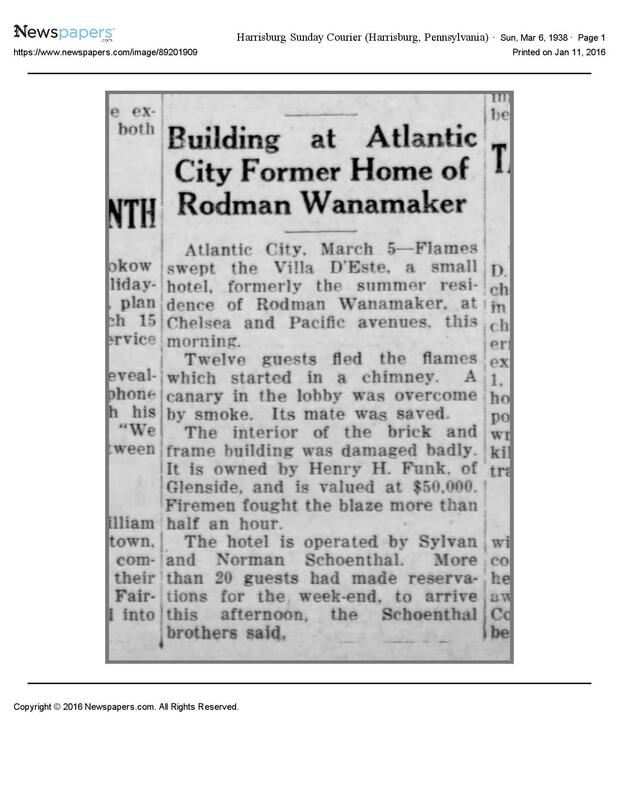 The earliest directory listing I have for him is the 1938 Atlantic City directory where both he and his brother Sylvan are listed as working at the Villa D’Este hotel (located at 3100 Pacific Avenue) and living at 102 South Chelsea Street in that city. Well, actually there is no separate listing for Sylvan, but rather one for a Mrs. Sylvan Schoenthal at that same address. I believe that the directory editor mistakenly thought Sylvan was a woman and the wife of Norman Schoenthal. 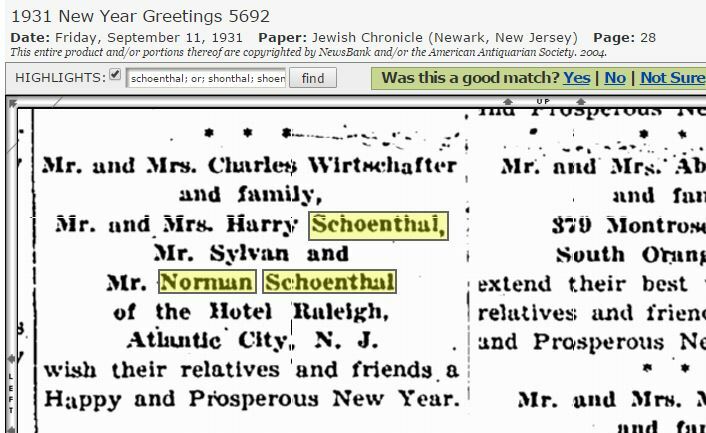 In this same listing, you can see that Norman and Sylvan’s parents, Harry and Esther (Wirtschafter) Schoenthal, were also residing at 102 South Chelsea Street, but still working at the Hotel Raleigh. As the article indicates, the Villa D’Este hotel was not owned by the Schoenthal brothers, but managed by them. 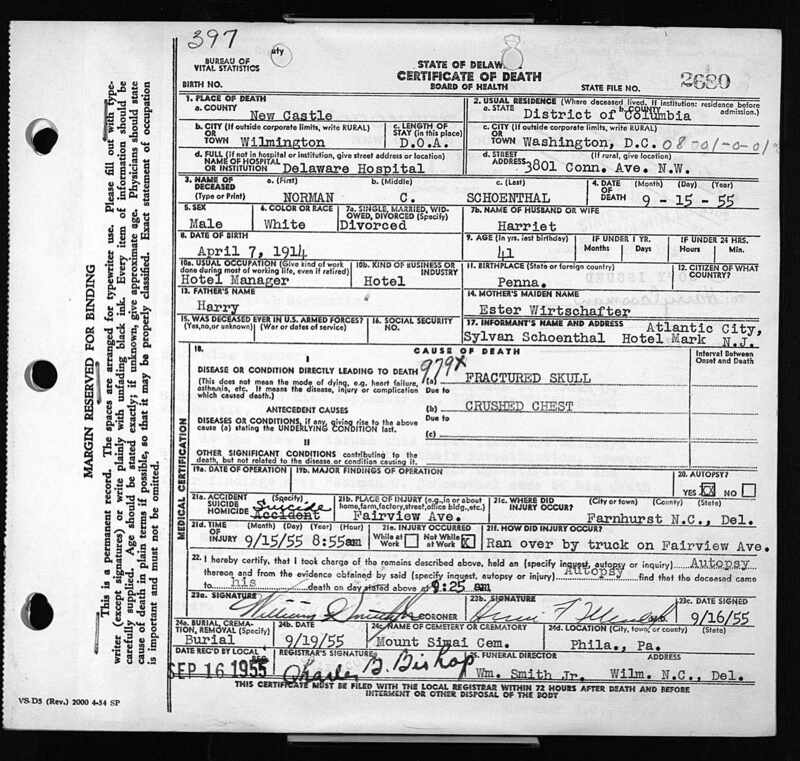 In 1940, Harry, Esther, Sylvan and Norman were all still living together in Atlantic City, but no street address is indicated on the census record. The record also has some of the relationships confused. Sylvan is listed as the head of the household (and as single, making me doubt even more the 1938 directory listing for a “Mrs. Sylvan Schoenthal”); Norman is listed as the manager. Their mother Esther is listed as the assistant manager, and their father Harry is listed as “Brother.” How many think that Harry was the manager and Norman the brother? Or was Harry really the head of household and Sylvan the manager? One thing is certain: Harry was not Sylvan’s brother. In addition, the census identified Sylvan as the hotel proprietor, Norman and Esther as partners, and has no occupation or title given for Harry. I am not sure what to make of that, but my guess is that the line for “Harry” was really describing Norman and vice versa. Also, the news article above indicated that Sylvan did not own the Hotel D’Este, so was this a different hotel? Or had he purchased it since 1938? Or is the census record inaccurate on this point as well? I don’t know. Sigh. More errors and ambiguities in census records…. Although the 1940 census record for Harry and his family did not include a street address or hotel name, in 1941, all four family members are listing in the Atlantic City directory as residing still at 102 South Chelsea Street, and Sylvan and Harry have the notation “Villa D’Este” next to their names, as they did in the 1938 directory. So the fire did not result in closing down the hotel. Both Sylvan and Norman served in the military during World War II; Norman enlisted in the army on February 24, 1942, for the duration of the war, and his brother Sylvan enlisted on September 5, 1942, also for the duration of the war. 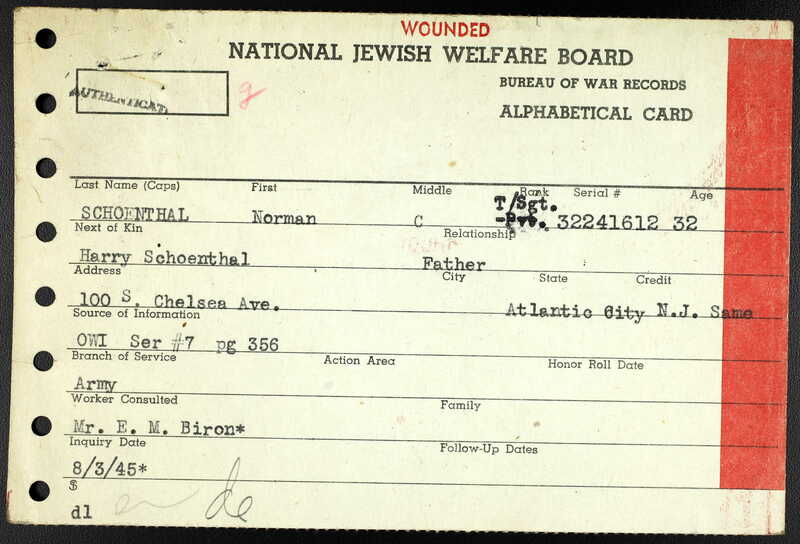 Norman’s record with the Jewish Welfare Board about his military service indicates that he was wounded during his time in the service, but I could not find any further details. Atlantic City’s future seemed bright, until World War II. After the war, the public seemed to stop its love affair with The World’s Favorite Playground. Possibly because of the public’s access to national air travel, the shift of the population westward, the general deterioration of the city, or a shift in the public’s taste for more sophisticated entertainment, Atlantic City lost much of its shine; and most of its tourists. Interestingly, it appears that Norman had been in Florida before the war, returned after the war to Atlantic City, and then again returned to Florida. Norman became active in the local business association and was elected president of the Palm Beach County Chapter of the Florida State Motor Courts Association, according to the April 27, 1951, issue of the Palm Beach Post (p. 15). 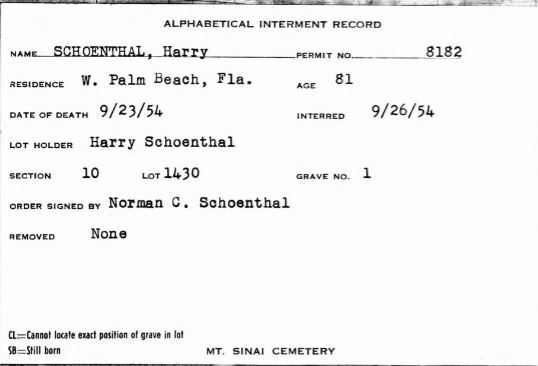 Norman’s parents, Harry and Esther Schoenthal, must have also moved to Florida in the 1950s because Harry died in Palm Beach on September 23, 1954. He was 81 years old. According to the records at Mt. Sinai cemetery in Philadelphia where he was buried, he had been a resident of West Palm Beach, Florida, when he died. He was buried near his parents, Simon and Rose (Mansbach) Schoenthal. Sadly, a year later Norman Schoenthal died on September 15, 1955; he was only 41 years old. He also was buried at Mt. Sinai in Philadelphia where his father and his grandparents were buried. According to the cemetery records, he was a resident of Atlantic City when he died and thus I assumed he must have returned there after his divorce and the sale of his business. There is a lot to digest here. First, this is obviously the right person, given the parents’ names, occupation, informant’s name, burial place, and former wife’s name. But what was he doing in Delaware? And why is his residence address in Washington, DC, not Atlantic City or Florida or Delaware? Mt. Sinai’s records reported his residence as Atlantic City. The address in Washington, 3801 Connecticut Avenue, is an apartment building. The cause of death is very disturbing. Norman was run over by a truck, resulting in a fractured skull and crushed chest. The coroner originally typed “accident” on the death certificate, but then that was crossed out and “suicide” was handwritten above it. What had happened that led the coroner to change his conclusion? The certificate states that the injuries occurred in Farnhurst, Delaware. When I Googled Farnhurst, the first thing that popped up was “Farnhurst Delaware State Hospital,” once known as the Delaware State Hospital for the Insane at Farnhurst. Had Norman been a patient there? I could not find a Fairview Avenue in Farnhurst on current maps, only one in Wilmington, which is about six miles from Farnhurst. I am hoping to learn more and have contacted the Wilmington Public Library Reference Department to see if they can locate a news article about Norman’s terrible death. As for his survivors, his mother Esther had returned to Atlantic City after living in Florida; she is listed in the 1957 Atlantic City directory. As the informant on his brother Norman’s death certificate, Sylvan had given his address as the Hotel Mark in Atlantic City. Sylvan had married a woman named Rose by 1954, as they are listed together in that year’s Atlantic City directory as well as in the 1956 directory for that city. But they are not listed in the 1957 Atlantic City directory. It seems that Sylvan and Rose had moved to Florida. In January 1960, Sylvan and Rose were divorced in Dade County, Florida. It must not have been an amicable divorce as there was some post-divorce litigation. See Schoenthal v. Schoenthal, 138 So.2d 802 (Fla. Dist. Ct. App. 1962). Esther Wirtschafter Schoenthal died on October 21, 1969; she was 80 years old. She was buried with her husband Harry and her son Norman in Mt. Sinai cemetery in Philadelphia. Her burial record indicates that she was still residing in Atlantic City at the time of her death. Sylvan Schoenthal, the only remaining member of his immediate family, continued to live in Miami, Florida, for the rest of his life. He died on December 28, 1998, when he was 86 years old, according to his obituary in the December 31, 1998, issue of the Palm Beach Post (p. 95). According to the obituary, Sylvan had moved to Miami in 1942, but that is not consistent with the directories and other sources I located. He apparently was also in the hotel business in Florida. In addition, he had three children, whom I am now trying to locate. I have been in touch with his step-great-granddaughter, who reported that he was a kind man, well-loved by her great-grandmother’s family. 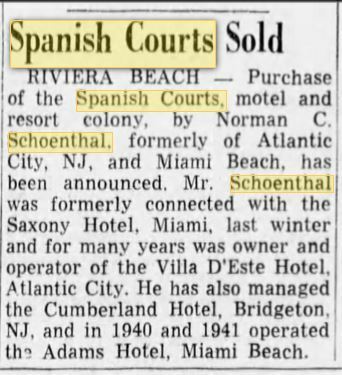 It would be interesting to hear any family stories about the Schoenthal family’s life in the hotel business in Atlantic City in its heyday. As we will see, I could not find anything about when Maurice died, so I don’t know how long he lived. 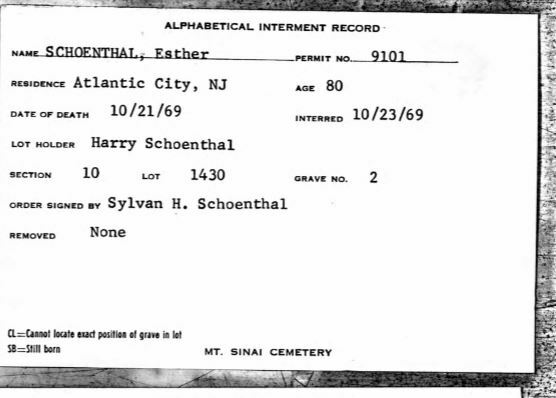 This entry was posted in Genealogy, New Jersey, Schoenthal and tagged atlantic city, Florida, New Jersey, Philadelphia, schoenthal by Amy. Bookmark the permalink. Whew, that represents a lot of work on your part, Amy. So fascinating to see how that family spread out. And so sweet to hear a nice report from someone who really knew one of them. I also was so glad to find her—it always brings these stories into reality when someone knew the person. It makes all of the ancestors come alive to us! I really enjoy how you present your stories. SO many photographs and documents to show your points. I used to live in southern New Jersey and funny thing I never went to Atlantic City, but I did visit Cape May several times, which retained still much of the quaintness of an early NJ seaside town. As I recall from reading about Philadelphia history, is that it was a very unhealthy place to be in the summertime, hot, high humidity and lots of bad smells and diseases. Many people who had money would go to the seacoast for healthier living. Thanks, Janice (and please feel free to comment on FB!). My dad grew up in Philadelphia and visited Atlantic City during the summers. I don’t know if he knew Norman or Sylvan, but I will ask him when I next see him this weekend. Funny – I had a similar experience. Was displeased by Atlantic City but loved Cape May, also because I am into birding. I should revisit—if only to see where my relatives lived. But I will go when the weather is nice and avoid the casinos! You found a lot but have some mysteries to solve now. I was thinking that Norman may have left a note or witnesses came forward. I had a relative that committed suicide in 1895 and found an inquest for him. Maybe there is one for Norman. I am in touch with the Wilmington Public Library and will update this story after the weekend. Stay tuned! And thanks for reading and commenting! So much information – I really enjoyed the way you shared your extensive research. Norman’s cause of death certainly is disturbing. I would want to peek in the local newspaper(s) and see if there is any mention of his “accident”. Good luck in your continued search! I have, and I will report on it in my next blog post. Stay tuned!! Amy, to get the “present” without searching about Atlantic City myself- quite a treat. At least a decade ago I was there once and happy to leave after a short visit – have never been into gambling! But we do have a lovely casino in Wiesbaden with a long tradition. Most famous visitor here and in Baden-Baden was Fyodor Dostoyevsky! That’s cool!! I am glad you liked the post. We were in AC twice but it was winter so we never left the casino. After losing $25 in the first 30 minutes in a slot machine, we switched to nickel machines or watched others. We haven’t been back in 30 years! Amy, I am Charles Wirtschafter’s grand-daughter so I guess I am a cousin. My family owned the Raleigh Hotel in Atlantic City and had ties to Atlantic City, NYC, Miami.. I loved reading this post of your research. I learned a lot. Thank you very much for posting it. Hi Jenny, I am delighted to hear from you and so glad you liked the post. I will email you separately to see if we can learn anything more from each other!